Perhaps you can tell by the title. I REALLY liked this cake. The site that I got this recipe from called it Ultimate Lemon Cake. 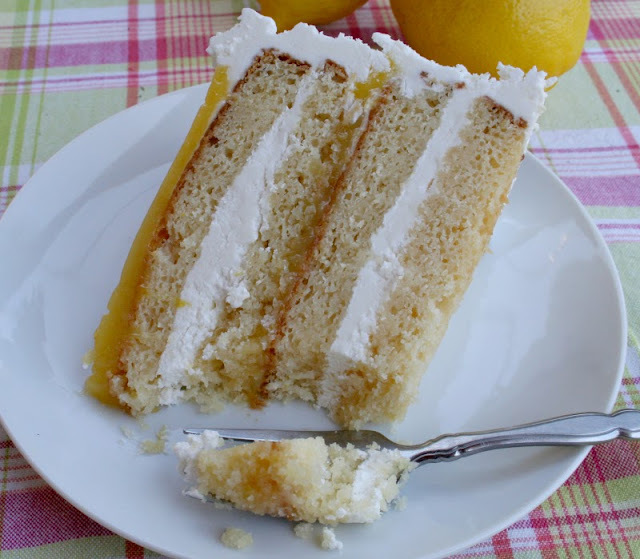 I think it should be called OMG THIS CAKE IS REALLY LEMONY AND JUICY AND CREAMY AND TART AND SWEET ETC. CAKE. Or maybe, The Best Cake Ever That Isn't Chocolate Cake. Don't eat practically the whole cake. I may or may not have gained 5 pounds done that. It has 4 steps but don't let that intimidate you please. They are easy steps. Not easy steps like making a cake mix and using canned frosting. But easy like not really complicated or easy to mess up. Gently fold in dry ingredients in three equal portions, alternating with the milk. Begin and end with the dry ingredients. Pour batter evenly into 2 well greased and floured 8 inch cake pans bake in a 325 degree oven for about 35-40 minutes or until a toothpick inserted into the center comes out clean. Watch it carefully this cake should not be over baked! If you use a 9 inch cake pan like I did you need to watch it even more because it will cook more quickly. An 8 inch pan would be prettier for the layers as well. As soon as the toothpick comes out clean, remove the cake from the oven and let it rest in the pans for 5 minutes before turning it out onto a wire rack to cool completely. Simmer together gently for about 15-20 minutes. Remove zest and let it drain on a wire rack. Reserve the syrup to brush on the cake layers. You will use about 1/2 of the syrup for this. The remaining syrup - just a simple syrup flavored lemon (and very delicious) - can be used for lemonade, or perhaps a Lemontini...that you might be able to adapt from this recipe. Cover with plastic wrap and chill completely in the fridge. A note about Lemon Curd. Make some! There is no excuse for buying a jar of lemon curd. Jarred lemon curd - while not entirely gross - is not nearly as delicious as fresh. And fresh is easy. You can use the egg whites in another recipe. I think you can freeze them??? Using an electric mixer on low, mix the butter and sugar together until the butter breaks up and gets evenly dispersed throughout the sugar in small pieces (I used very soft butter so it was just creamy for me) The mixture will still appear dry at this point. This stage ensures even distribution and prevents butter lumps in your frosting. Add liquids and zest. Liquids can be adjusted to your taste - I used 4 tbsp milk but a little extra lemon juice. When the icing reaches the desired consistency continue to beat it on high speed for 5 minutes to incorporate more air into the frosting to make it lighter and fluffier. This was a new step for me. I had never seen this suggestion before. It worked amazingly well. And I might add - this frosting is AMAZINGLY GOOD! Split the two layers of cake horizontally to create 4 layers. Brush the reserved syrup into the cut sides of the cake layers. Add the next layer and using a piping bag, or a heavy plastic bag with a half inch opening snipped off the corner, pipe a ring of frosting around the perimeter of the cake. Fill the ring with half of the lemon curd. Add the next layer of cake and top with more of the frosting. Add the final layer of cake. At this point frost the sides of the cake. Pipe a border on the top and bottom of the cake. 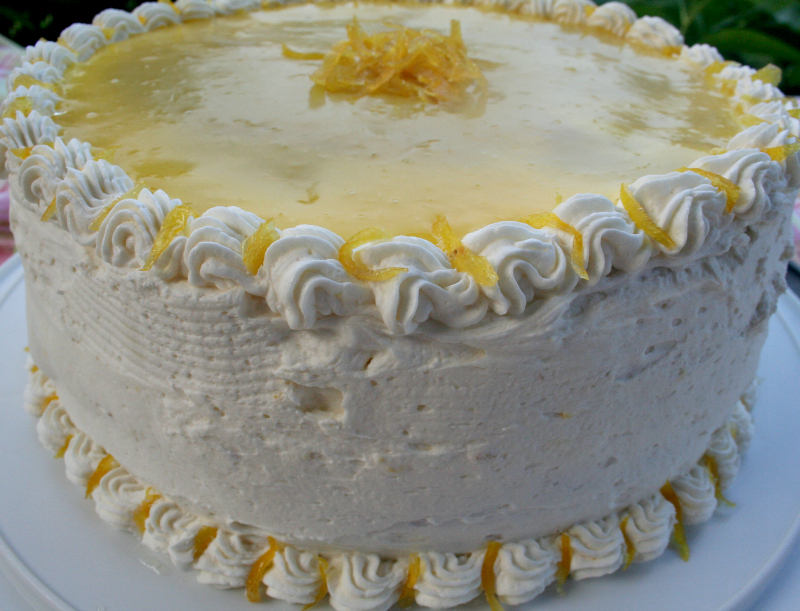 Add the second half of the lemon curd to the top of the cake and garnish with pieces of the candied lemon zest. You can use kitchen scissors or a sharp paring knife to cut the lemon zest into small pieces. The layer of lemon curd looks better with a skim coat of frosting under it - if you care about that sort of thing. Chill for several hours or overnight before serving. The cake is great cool or room temperature. I thought it tasted much better at room temperature so let it sit out a while before you serve it. 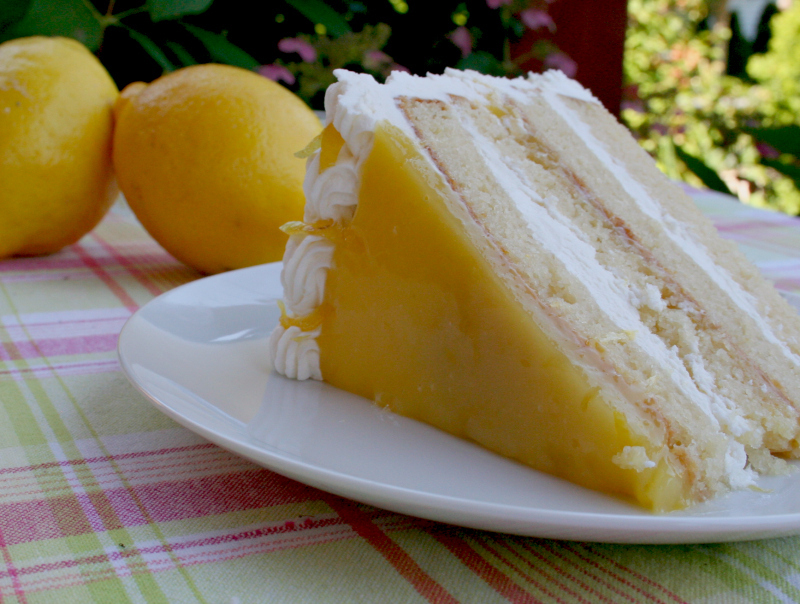 You may be struggling to figure out how many total lemons are in this cake. I believe it was six. If you want to see what this cake looks like when made by a professional go here. I was amazed how quickly I was able to put this cake together. And then tell me what you think it should be called. I am lonely for this cake. Your cake is absolutely beautiful Karen! 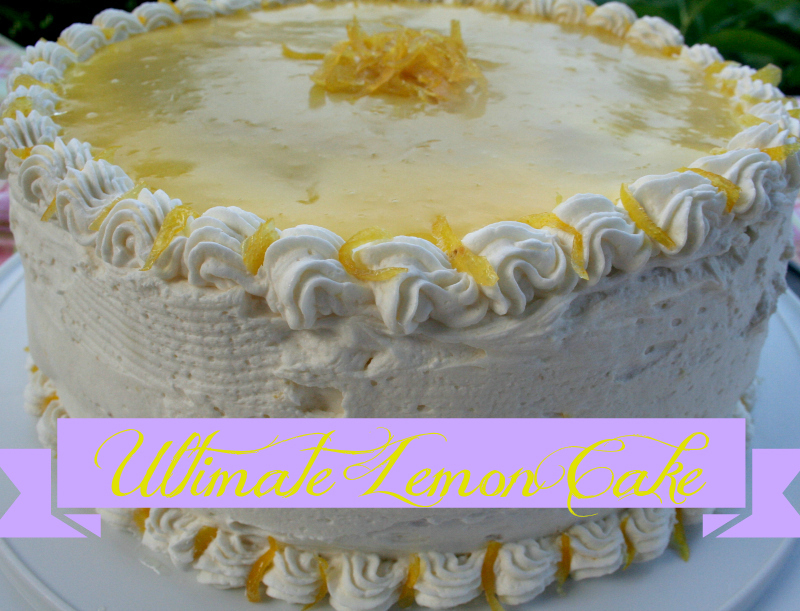 Since lemon is my MIL's favorite, I'm pinning this one to make for her birthday next year. Of course, I'll have to make a few practice ones first!! 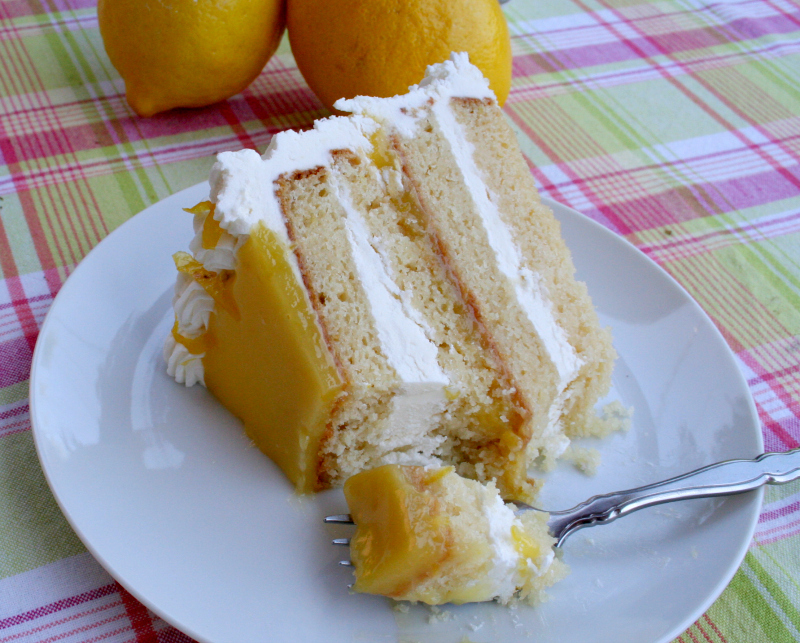 I'm not a fan of frosting so I'm going to need to change it up a bit...lemon curd on a big fat slice of cake. Then repeat as necessary. I feel 5 pounds coming soon. Pinning to my cake board. Blogging can be bad for the waistline. This week I saw a fabulous lemon pie, your cake and some oatmeal cookies. I am trying not to bake. This sounds -- and looks --- AMAZING!!!!! I love all things lemony! Oh, wow! This looks so yummy! I've had lemon on the brain lately.. bought a mix for lemon bars, but may have to pass on that, and make this cake! YUM!!! Wow delicious!! thank you so much for your comment! looks so yummy!! I would like a bite!!! thanks for the recipe!! Mouth watering Karen - absolutely mouth watering !!! Off to pin this gorgeous cake! Oh boy I lurve lemon curd, my Grandmother used to make it. Your cake looks simply scrumptious !